Assam State Urban Livelihoods Mission Society, Goalpara. 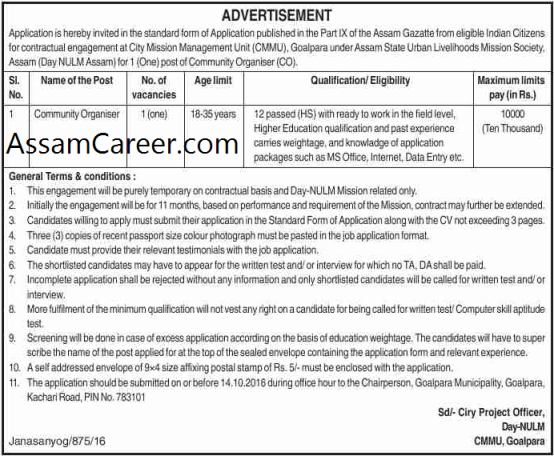 Applications are invited in Standard Form of application as published in Part-IX of Assam Gazette from eligible candidates for filling up of the following posts at City Mission Management Unit [CMMU], Goalpara under Assam State Urban Livelihoods Mission Society [Day-NULM Assam]. Educational Qualification: 12 passed (HS) with ready to work in the field level, Higher Education qualification and past experience carries weightage. and knowledge of application packages such as MS Office, Internet. Data Entry etc. How to apply: Application should be submitted on or before 14/10/2016 during office hour to the Chairperson, Goalpara Municipality, Goalpara, Kachari Road, PIN No.783101.